Now that my upcoming book AutoCAD 2015 and AutoCAD LT 2015: No Experience Required is off to the printers I can (hopefully) begin giving my blog the attention it deserves. I look forward to sharing some new tips & tricks I have been gathering for some time in some future blog posts, but first a quick tip for controlling the way AutoCAD drawings open when you double-click on a file from Windows Explorer. The behavior most AutoCAD users expect is double-clicking a DWG file will do one of two things; launch AutoCAD if it’s not already running, or open the DWG in an existing AutoCAD session. Enter SDI at the command-line. While it’s certainly possible the SDI variable was changed from its default value of 0, the more common cause to drawings opening in a new session of AutoCAD is related to the application associated with DWG files on your computer. 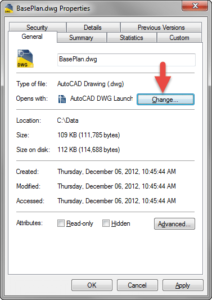 Although it might seem logical to set AutoCAD as the default program for DWG files, doing so will cause every drawing to open in a new session of AutoCAD. 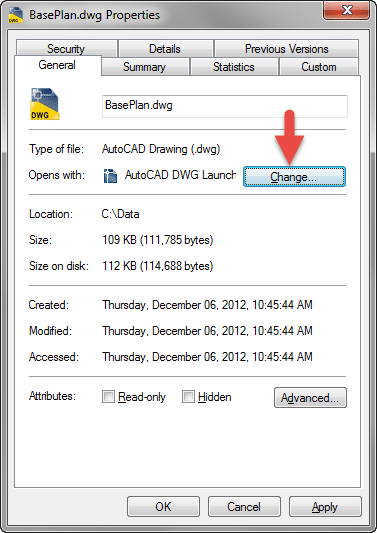 Instead, the default program associated with DWG files should be the “AutoCAD DWG Launcher”. 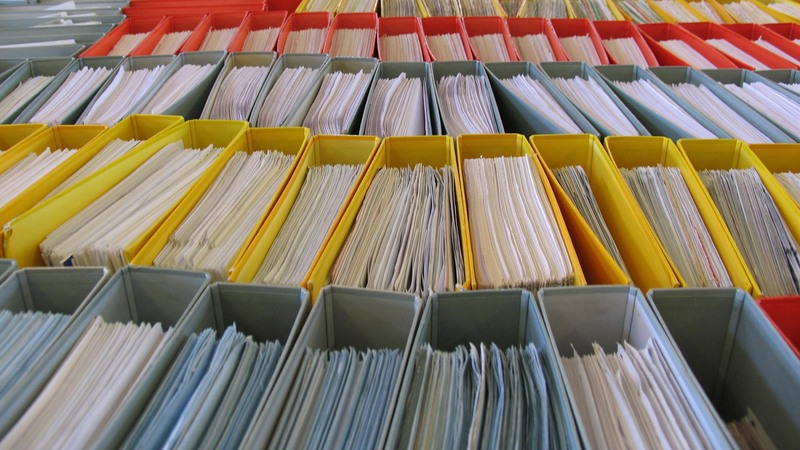 Locate a DWG file in Windows Explorer. Right-click on the DWG file and select Properties. On the General tab of the Properties Dialog, select the “Change” button next to the “Opens With” property. Locate “AutoCADDWG Launcher” within the “Opens With” dialog, and click OK.
Double-clicking DWG files from Windows Explorer should now open drawings in a single session of AutoCAD. The SDI is terrible because it causes the layer properties manager to revert to an older version, doesn’t allow the xref dock, and is just annoying. I want to open a new AutoCAD 2017 session whenever I double click a file in Explorer… is this possible? My problem is maybe the opposite. I only want ONE autocad dwg to open at a time. When I open a different dwg, I want AutoCAD to ask if I want to save the opened dwg first, then close said same dwg, before it opens the new or different AutoCAD dwg. The older versions of AutoCAD used to have that function, under tools I think. Can anyone show me how to accomplish that? It seems to me if I open a second drawing from the server it opens another instance of ACAD 2015. However if I open a second drawing from C: it uses the same instance. Hi, I’m experiencing a new problem with my ACAD LT 2005 today. I can’t open *.dwg files through Windows Explorer (Windows 7) (“there was a problem sending the command to the program”). Also, when I right click a drawing file in Windows, open with… ACAD icon is shown as “not applicable”. I am completely frozen up at this time, and the desktop icon will no longer open either. Can you offer any help? Thank you, Jeff. I’m using AutoCAD Electrical 2015, i see two autocad dwg launcher in “Opens With” dialog. And DWG files sometimes opening in same window but sometimes opens seperate. Its really strange. I wonder if this is about version of DWG files. Because i was using Autocad LT before. 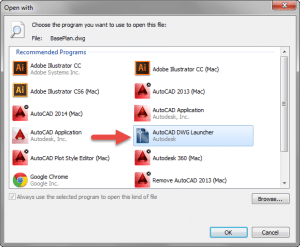 The intended behavior of the “AutoCAD DWG Launcher” is it will open drawings using the last version of AutoCAD you used. 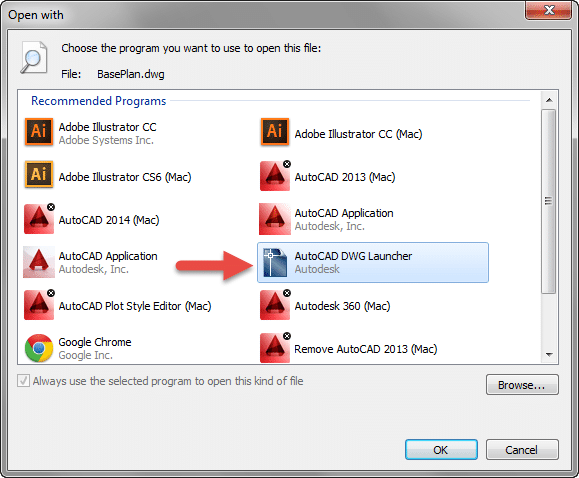 If you have AutoCAD Electrical in addition to another version of AutoCAD installed on the same machine, the DWG launcher should open DWG’s with the last version of AutoCAD you used. I have a different problem, but relating to opening up drawings. As a standard procedure I normally have 2x AutoCAD 2014 instances/applications open at any time (for easier viewing and editing). I normally only work in 1 of the applications and the other one would only be used for opening up drawings (read only). The problem now occurs when trying to open up drawings from Internet Explorer. When opening drawings from IE, the first application opened would receive priority, whereas if you open something in Windows Explorer the last one would (but here you could also manually open them). Normally the first application I open is the one containing the drawing that will be edited. The second application would contain all of the drawings I would be looking at. Some of the instances might end up crashing, etc. etc. and as such the “the last application opened” may change. Is there any way to make it so that you could manually choose which application (of the open) to use when opening drawings from Internet Explorer (or browsers in general)? This does not happen for me as I have just upgraded 3 users to Autodesk LT2015 on Windows 7 32bit and DWG files do not open from Explorer and also there is no icon’s on these files either. I have updated the registry to the HKCU and HKLM Classes DWG Shell command to open into Autocad and it opens the Autocad application but does not open the file ? if all else fails, make sure you don’t have your program set to open as administrator. I had the problem opening in separate instances, but realized that it was because we had changed that to resolve a temporary network issue. I’m using AutoCAD Electrical (as part of Design Suite Ultimate 2015) I’ve been trying to find a solution to this issue (couldn’t really call it a “problem”) but the above doesn’t solve it for me. I’ve always used the launcher, and it’s still the default dwg file opener, but a new session still starts every time I double click on a dwg file in Explorer. What am I not doing or doing wrong? same problem, to the tee. any resolution? Set the variable ‘taskbar’ to 0 to open drawings in the same window, not a new one. Hmm, this did not help me either. SDI is set to 0. I don’t believe taskbar is going to work. I tried it and it didn’t but since it is a command, I don’t think it would work anyways. I read your post and found it very much helpful for the cad users. I am also a cad user and i know while working with cad software we need to face so many problems, if we are not an expert. So i really want to thank you for this post and i request you to keep posting regarding cad software. I got a little problem with that.. I tried AutoCAD 2015 first but then I uninstalled and removed it from my computer and installed AutoCAD LT 2015.. Now Im trying to open DWG files with AutoCAD DWG Launcher like you said but now my stupid computer is trying to open the files with “acad.exe” and not with “acadlt.exe”.. Any solutions?